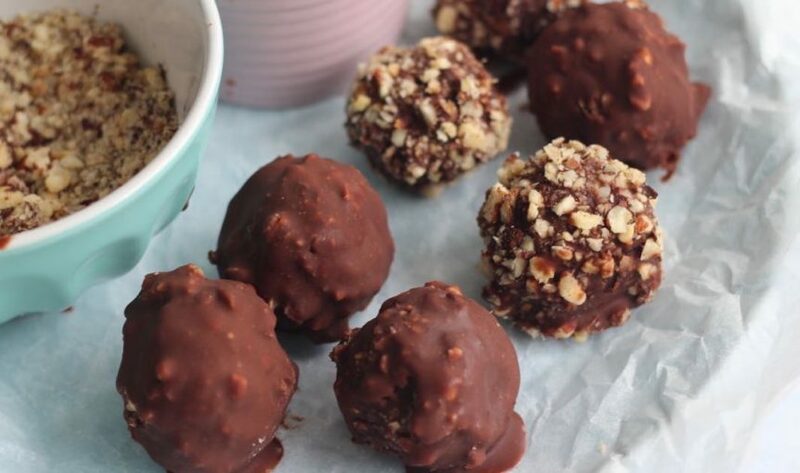 This healthy Ferrero Rocher recipe might just be the perfect, most delish Valentine’s Day treat you can whip up for your lover or yourself or your friends or your family. They’re all kinds of epic and delish. It’s another collaboration with our favourites, SupaBarn! We’re currently working on creating some epic visualisation meditations. Can not wait to share them with you. We’ve been practising with everything so we’d like to run you through a guided written visualisation (hehe not sure if that is a thing). You can’t close your eyes because you’re reading this. So do not close your eyes, but use your imagination. *Merries’ voices slowing down almost-kind-of-hypnotising-pace*. We’d like you to see yourself arriving home from a day of work, you’re excited to be home. Especially today because it’s Valentine’s Day. You can feel all the love around you, coming from every direction. You feel worthy, fulfilled, excited and energised. You feel joyful. You come home to a super tidy house. Everything is just how you like it. You feel at peace, you feel happy. You see a plate of these delicious morsels (yes the below super easy Ferrero Rochers) in the hands of the man/woman of your dreams (or Chris Hemsworth/George Clooney/Margot Robbie/Beyonce). Happy Valentines Day, I LOVE YOUUUUUUU! Yes, yes. We are cray. The REAL visualisations are actually going to be amazing. They’re all based on replacing your negative self-talk into positive self-talk. Let’s call it, creating a Merry Mind! Ok so moving back to the actual healthy Ferrero Rocher recipe! 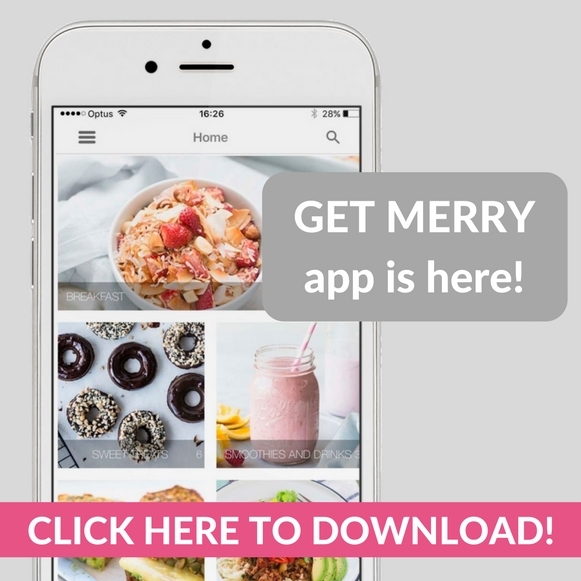 This recipe featured in our Get Merry Challenge. It was 3 weeks of healthy meal plans with weekly shopping lists, a private Facebook group and a bunch of expert sessions talking all things health and happiness. 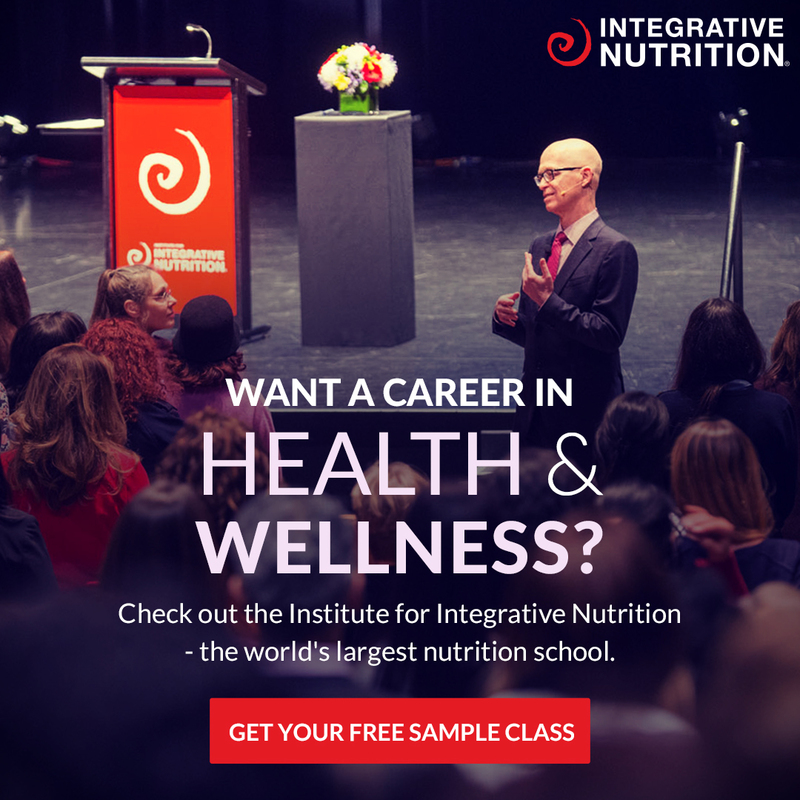 The next one is happening in May and you can get on the waitlist HERE and be the first to hear about the early bird special! And yes of course we include sweet treats in our challenge meal plans. Duh. Hellloooooo it’s called sweet treat Sunday because life is way too short to say no to dessert everyday. Yah?! We’d love to have you join us for the Challenge. How fun, we can enjoy sweet treats like this and know that they’re only filled with good stuff. Just make sure you don’t eat the whole batch ok! OK! Even if George Clooney tells you to, don’t! If you do make them for Valentine’s Day you could go all out and make a platter of little V Day healthy treats. Like these top deck choccies, matcha chocolates and what about choc dipping sauce, fruit and a little fondue action!? Yes! Talk about CUTE as! Maybe stuff the dinner and go straight to this dessert. Yep, we reckon good idea! If you make them let us know! Post a pic on social media! In a blender or food processor add the hazelnuts, coconut, cacao powder and salt and whiz till combined . Add the peanut butter, rice malt syrup, coconut oil and vanilla to the blender and whiz again until combined . Roll tablespoons of mixture into balls, press a whole hazelnut into the centre, then roll again until the ball is smooth. Continue to do this until all the mixture is used . place into the fridge for 30 mins . You can either leave as is, or continue with the choccy coating (you should continue!) . In a double boiler add the cacao butter, rice malt syrup and vanilla . stir slowly until melted together . add the raw cacao powder and keep stirring until the choccy mix is nice and smooth . Dip the balls into the chocolate, then coat with chopped hazelnuts, continue with all balls, then place into the freezer for 5 minutes . Once the first layer of chocolate has had a chance to set, coat again with the choccy topping and place into the fridge until ready to serve! Holey yum... you guessed it... BALLS! You can totally make this into a brownie slice instead!